The base price of 1895.00 is for the swingarm in RAW FINISH ONLY!! Please select from the options below to customize your fat tire kit. After selecting your options click on the update price button for your customized price. Availability and turnaround times will vary. Please call us at 1-866-411-BIKE before placing your order. THE PRICE LISTED IS FOR A FTD CUSTOM WHEEL SET IN RAW FINISH. YOU CAN ALSO CHOOSE FROM BLACK CONTRAST CUT, POWDER COATING, OR CHROME FINISH ALSO DIFFERENT REAR WHEEL SIZES IN THE DROP DOWN BOX. FOR FURTHER ASSISTANCE PLEASE CONTACT US AT 1-866-411-BIKE. The base price of 1895.00 is for the swingarm in RAW FINISH ONLY!! Please select from the options below to customize your fat tire kit. After selecting your options click on the update price button for your customized price. Availability and turnaround times will vary. Please call us at 1-866-411-BIKE before placing your order. 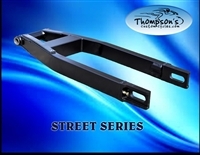 GIVE YOUR STREET BIKE A NEW LOOK WITH A COMPLETE BOLT ON SWINGARM THAT USES ALL OF YOUR STOCK HARDWARE.